We have today – Remembrance Sunday – asked Historic England to list the war memorial on Lower Green West. It has served Mitcham for nearly 100 years and is worthy of this national recognition. The story of the war memorial is an interesting one. It began with the Mitcham War Memorial Committee formed in February 1919. This chose a site in the churchyard of the parish church. A memorial was erected in 1919 but was not popular. For Peace Day, the 19th July 1919, a temporary memorial was put on the Lower Green, near to the Vestry Hall which was then Mitcham’s Town Hall. The War Memorial Committee then announced that a permanent memorial, on the site of the temporary one, would be erected. A form was sent out to all residents asking for details of the fallen, and 522 names were received. Another appeal was made for more names. The memorial was unveiled on 21 November 1920, by Lieutenant General Sir Herbert Edward Watts KCB, KCMG at a ceremony attended by 5,000 people. It was announced that iron railings would later be erected around the memorial, with a gate so that members of the public could add wreaths as and when they chose. There are 588 names inscribed on the four panels. Known details and short biographies of many of those commemorated can be viewed on the ‘Roll of Honour’ website. The memorial also commemorates but does not name those fallen in the Second World War and “those killed in other conflicts”. The war memorial is of Portland stone and comprises an octagonal plinth of five steps, on which is mounted a rectangular block, on top of which is a Latin cross. It is estimated at 19 feet high. The names of the fallen during World War 1 are inscribed on four stone panels, on each side of the rectangular block. The vertical edges of this block are chamfered, each of which have a bronze sword mounted. The swords are unusual and each sword, made of bronze, points downwards, and has a pommel of a St Edward’s Crown. The hilt has six studs. Photos after World War 2 show a wooden fence instead of iron railings so it is assumed that the original railings had been removed for the war effort. The current iron railings were possibly erected around 1950. The memorial was refurbished in 1962. 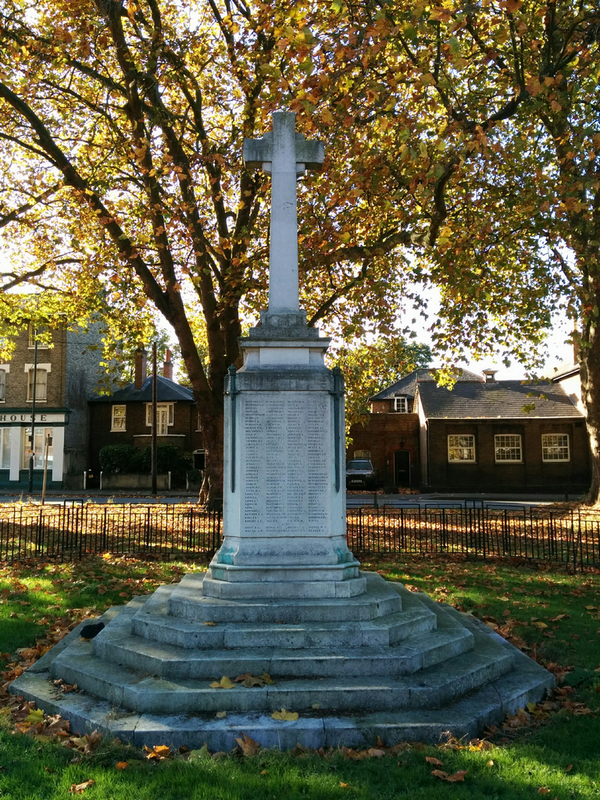 The war memorial is described as the “main focus” of Lower Green West in the Mitcham Cricket Green Conservation Area Appraisal and Management Plan. We welcome Merton Council’s support for this application and thanks are due to local volunteer Wade Brice for much of the research which has been undertaken to support the application. Our application also supports the war memorials programme promoted by Civic Voice. This entry was posted in Cricket Green Conservation Area and tagged listing, national listing, war memorial on November 13, 2016 by mitchamcricketgreen.